We have a GREAT Mimis Cafe printable coupon today…! Time to head over and grab breakfast (or dinner) and get a pack of four muffins for FREE….. SAY WHAT..!! Free 4 pack of Mini’s Muffins (usually cost $5.99) with the purchase of a breakfast or dinner plate! 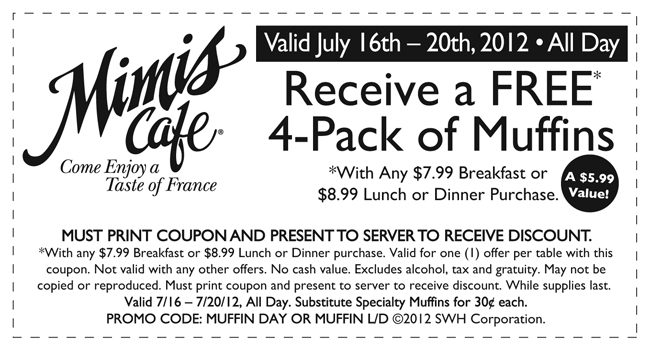 The Mimi’s Cafe coupon expires on July 20th, 2012.. Great coupon for any day! Enjoy the FREE muffins…. ! !